Charley Douglas, an undergraduate Biosciences student with a disability, talks about organising a placement overseas. Before my placement I wasn’t sure if I would be able to complete a full 10 months abroad, but decided to take a leap of faith and try it anyway. My disability did play a role in where I decided to go for placement. I needed to be somewhere where I could easily get back to England if I had to, and that was not colder than England! 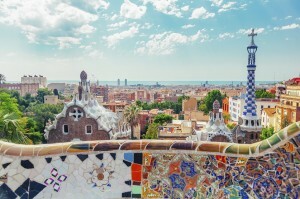 I spoke to a disabled student from my partner university, who did her Erasmus at Surrey, and after speaking to her I decided that Barcelona seemed the most accessible place out of my shortlist of choices. There are several major c hallenges I have faced. I have complicated medical conditions and a long list of medications. In my case I decided it would be easier to continue to get my medications and healthcare in the UK throughout the year, and as a result had to carefully plan appointments and make sure I would never run out of medication. I also encountered problems with airlines that are not particularly wheelchair friendly and as a result ended up with damage to my chair. I have now learned to do a little more research on airline as knowing your facts can really pay off in the long run. Travel here is generally pretty accessible, all buses have automatic ramps and many metro stations are also wheelchair friendly. Accessible travel was a big factor in deciding where I wanted to go on placement – some cities can be a nightmare to get around. Things that are normal in the UK such as pedestrian crossings that have an audio signal for a green light, aren’t universal so it is worth taking a trip out to see how you will be able to get around. Asking if places were wheelchair accessible, and for bus drivers to put down the ramp in a foreign language was also a bit tricky to start with but the majority of people I have dealt with have been great and between looking confused, my terrible Spanish and waving my arms around a bit, I have always managed to get my point across. Learning a few key phrases such as “I am diabetic” or “is there wheelchair access” before arriving in your host country is definitely a good idea in case of emergency, and maybe download google translate onto your phone for if you get really stuck. Now, 6 months in I am looking at further education in other countries and am planning on going travelling. It’s not easy, and problems will inevitably come up but I how have to confidence that I can do it, which is not something I could have said before my placement. Robert Young, International Student Support Advisor, talks about his role at Surrey and his Erasmus mobility trip to Valencia.